Ichiban Sushi, is a Japanese restaurant that serves up a range of Japanese food: the standard conveyor belt sushi, sashimi, udon etc… I feel that Ichiban Sushi, Sakae Sushi, prices its foods towards the affordable range, but it definitely has more variety than Sakae Sushi. But I like both of them anyways (depends on what I feel like having). The Ichiban Sushi located at the Toa Payoh HDB Hub and has a consistent stream of customers, especially during lunchtime. Sometime last week, my colleague and I decided to be generous to ourselves for lunch that day. So we ordered, Chicken Katsudon, Beef Sukiyaki and California Maki. We had decided to top up an additional S$7++ to include the salmon sashimi (4 thin pieces, miso soup and fruits - which happened to be 2 slices of oranges that day). According to Wikipedia, a katsudon (カツ丼) consists of a bowl of rice topped with a deep-fried pork cutlet, egg, and condiments. Beef and chicken can substitute for the pork. 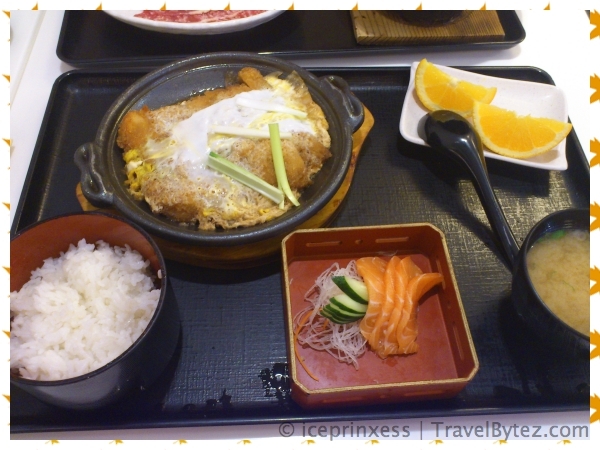 My order of Chicken Katsudon was served with the rice separate from the chicken cutlet and it was yummy. Thinking about it is making me hungry again. 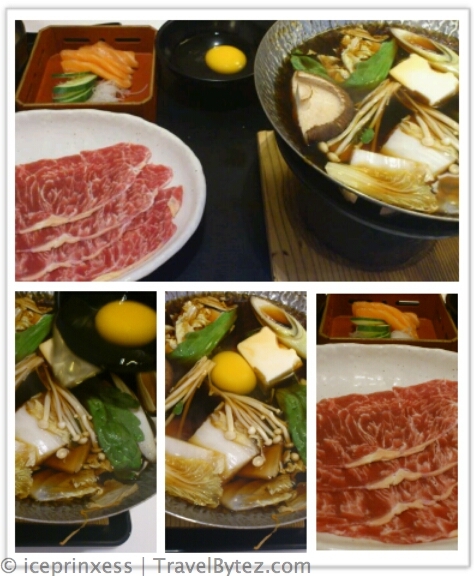 While Sukiyaki (すき焼き), according to Wikipedia, is basically Japanese hotpot consisting of meat (usually thinly sliced beef) which is slowly cooked or simmered at the table, alongside vegetables and other ingredients, in a shallow iron pot in a mixture of soy sauce, sugar, and mirin. Before being eaten, the ingredients are usually dipped in a small bowl of raw, beaten eggs.